So, you’re looking ahead to the New Year and hunting around for a few new healthy recipes to spice up your new 2017 nutrition plan. You want to leave the dull and boring things in the past and create dishes you’ll actually look forward to and enjoy. No problem, Iron Paradise Fitness has got you covered. Over the last few days the blog posts have been geared around the post-Christmas ‘get back on it’ plan and generally gettin’ after it in 2017. This one is in the same vein and squarely focused on nutrition. I hope you like it. 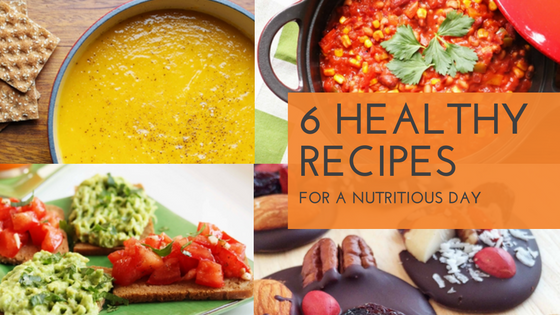 I’ve got 6 awesome recipes for you that you can weave into your meal plans for some tasty alternatives to what you might be having at the moment. And there’s no brussel sprouts in sight! Most of the recipes will take less than 15 minutes to cook, so you won’t have to worry about slaving over a hot stove all day. These are designed to work if you want to prep in advance or if you want to whip something up on the fly. Perfect if your still lacking motivation to do a full on meal prep. Knock these up as you go and you’ll have a good basis to start from. I’d love to see your own creations after you’ve given the recipes a try. Tag me in your photos on Facebook and Instagram. The best photo will get a a FREE copy of my November and December recipe packs, containing a total of 20 awesome recipes! Get cooking and GET CREATIVE! Place all ingredients in a juicer and press. Transfer to a glass and enjoy. If you do not have a juicer, place all ingredients in a high-speed blender. Blend until smooth, then place a mesh strainer over a bowl and pour blended juice over the strainer. Discard the pulp and pour juice into a glass. Half the avocado and scoop out the flesh into a bowl. Add lime juice and then mash roughly, using a fork, and season to taste. Chop the tomatoes and mix with the minced garlic, then season with salt and pepper. Drizzle with olive oil and mix again. Toast the bread and top 2 slices with avocado, then 2 with tomatoes. Sprinkle the avocado with parsley and serve. Prepare and wash the vegetables. Peel the butternut squash and half it, then remove seeds and cut into pieces. Peel and cut the carrot into pieces. Peel and chop the shallots and garlic. Peel the ginger and dice it finely. Peel the apple, remove the core and cut into pieces. Juice the orange. Heat the oil in a large pan and fry the onion, garlic and ginger for 3 minutes on low heat. Add the pumpkin and carrot and cook for 5 min. Add the water, vegetable stock cubes, apple and orange juice, then bring to boil, reduce the heat and simmer for 20 minutes. Puree the soup with a hand blender and serve. Cut the beets into wedges. Combine the yogurt, granola and beetroot in bowls. Mix gently and drizzle with honey. Prepare the vegetables. Chop the onions. Remove the stems and seeds from the peppers and cut into small pieces. Heat the oil in a frying pan and fry the turkey with the spice blend, salt and pepper for 5 min. Add the onion and peppers and cook for a further 5 min on medium heat. Meanwhile, place the corn and beans in a colander, rinse under cold running water then drain. Add the corn, beans and tomato sauce to the pan. Bring to the boil and cook for 5 minutes then simmer until warmed throughout. Season with salt and pepper to taste. Serve with brown rice to boost the carb content if needed. There you have it. 6 great dishes to add some excitement and flavour into your meal plans. I love the Turkey Chilli Con Carne. It’s super easy to make and the best thing is you can make a load of it in one go, which is perfect for meal prepping. I’ve purposely given you the recipe without the rice included. This means you can flex your carb requirements to suit your own goals. Add more if you’re bulking, or cut back in your trimming down. It’s up to you. To round out your nutrition plan for the day, add in your usual post-workout shake and some extra fruit snacks. And if you’re looking to boost the protein content, try adding some chicken to the soup. It tastes great and will definitely fill you up. I also like to add some casein protein powder to the Greek yogurt. It turns it into a thick and creamy consistency and tastes amazing. I hope you enjoy getting channelling your inner Gordon Ramsey. Get that apron on, head to the kitchen and get started on finishing off the year in a healthy way. And don’t forget to send me pictures of your creations! Need help putting your meal plan together for 2017? There’s a lot of component parts to consider in your efforts to build the body of your dreams. Weaving in healthy and nutritious recipes can be difficult. Often people struggle to get the right macro nutrient balance and end up resorting to a plan of plain chicken, steamed veg, and boiled rice because it’s the simplest option. But being the simplest option is not always the best option. A meal plan that is set up around foods you don’t really enjoy is doomed to fail. It might take a day, a week, or maybe a month, but eventually you will succumb to the desire of wanting to eat something that actually tastes good. You then abandon the diet totally and spend the remainder of the year making no real progress. Now’s the perfect time to make sure this isn’t your story for 2017. Make 2017 the year of BIG changes and the year where you take full control of you fitness goals and turn them into a reality. If that sounds like your perfect year, then I want to help you get there. I believe that everyone can achieve that body transformation they’ve longed for. It’s not the reserve of magazine cover models and movie stars. With the right approach to training and nutrition, it’s all possible and I want to show you how. How strength-based training will help you build more lean muscle than ever before, without the need to sacrifice your life and spend hours in the gym day after day. That meal plans don’t have to be dull and boring. There really is no need to eat boiled chicken and steamed vegetables 3 times a day to shred that unwanted body fat. That you can enjoy the process of transforming your physique. I know this method training and diet is effective because it’s exactly what worked for me and changed my physique drastically in a short amount of time. After following this approach for the last 2 years I look AND feel like a new man. That’s a 10kg increase in lean muscle and roughly a 4% drop in body fat. I want to show how to get similar results by using the same principles as I did. I’m truly excited about bringing my training methods to the big wide world. Through a simple, personalised, and honest approach, my aim is to change not just your physique but your entire well-being at the same time. Think about how you’ll feel walking around with a body you can be proud of. Your confidence will be through the roof! Wouldn’t that be great? If you’re ready to start your 2017 transformation now, click here to discover all the details about my online coaching products and services. I’m looking forward to working with you and making some drastically positive changes in your life!